- How available are the new Nikon DSLR's? - Is the D700 history? If you're busting with pride over a great photo you just had published-- We have a forum just for you! The new I have been published! forum is designed to let us all share in your accomplishment with our own congratulations. Share the good news and help inspire us all. The forum is open to all members who have had any images published in any manner and at any scale. The exhilaration and pride that comes with having your work distributed is something to be shared. It is an accomplishment that will help inspire us all. If you have had an image or series of images published in newspapers, books, magazines, Web-sites or any other mass-distribution media -- tell us the great news! Our recently completed photo contest which awarded prizes to new members was so popular that we're launching our brand new four-week Phase IV. This time, we are giving out one Photoshop Bundle by Topaz Labs (currently valued at $149.99 USD, with a normal price of $270) once every week for the next four weeks. Topaz Labs, makers of popular Photoshop Plug-Ins such as Adjust, Vivacity and DeJPEG are currently offering a very generous 25% discount for all contributing Nikonians at the Silver, Gold and Platinum levels. Check you Nikonians Rewards Page for details. If you registered between August 30th and September 26th, no matter at which level (from Basic to Platinum), you can participate in this contest. The first winner will be announced Monday September 7, 2009. The last one in this series will be announced on September 28, 2009. Complete details and a guide on how to prepare your entries are available in our New Members Welcoming Photo Contest Phase IV announcement. Roberts Imaging now has the new Nikon D300s (body only) in stock, available for delivery. Customers get free shipping for orders over USD300. Datacolor, recognized worldwide for their color management products, has introduced a new feature-packed bundle of hardware and software. 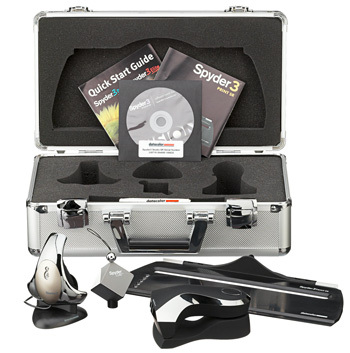 The package includes the SpyderCube™ RAW calibration device (which eliminates any need for traditional 18% gray cards); the Spyder3Elite™ monitor calibration tool and the new Spyder3Print SR™ (Strip Reader). According to today's Press Release, the Spyder3Studio SR calibration system "is built on the solid foundation of Datacolor's extremely popular, and highly revered Spyder3Studio Kit." (full text of the Press Release is provided further down in this blog). If you are not familiar with these products yet, check the Datacolor videos on the SpyderCube™ to see how it is used on location and back in the studio. 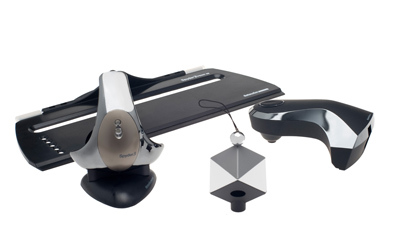 They also provide a video of the Spyder3Elite™ in use. Throughout the month of August, Datacolor is offering significant savings exclusive to Nikonians members on their Spyder3Elite system. Complete with software and target color patches, your monitor can be calibrated in minutes; and you can be confident that what you see on the screen is what everyone else will see - in print or online. Check your Nikonians Rewards Page, and click on the Datacolor voucher for details. Lawrenceville, NJ, August 26, 2009 - Datacolor, a global leader in color management solutions, continues its long heritage for providing photographers, photo enthusiasts, and other creative artists, with precision color management solutions with the introduction of its new Spyder3Studio SR™ calibration system. The new system is built on the solid foundation of Datacolor's extremely popular, and highly revered Spyder3Studio Kit. The Spyder3Studio SR now offers photographers a complete solutions package and represents a true breakthrough in performance and price. Color management is essential for today’s complex digital imaging technologies. To ensure outstanding results, proper color management should occur at three primary points during the photographic process: image capture, digital desktop image manipulation, and print output. Designed with a strong understanding of the needs of creatives and photographers, Datacolor's Spyder3Studio SR offers an uncompromised calibration solution for each stage of the process to help create, view, and share photographs as they were envisioned. The Spyder3Studio SR workflow solution includes the new, and highly decorated, SpyderCube™ RAW calibration device that eliminates any need for traditional 18% gray cards; the Spyder3Elite™ monitor calibration tool which has become an industry standard and trusted by millions of photographers and enthusiasts; and the new Spyder3Print SR™ (Strip Reader) which offers significant advances in creating ICC printer profiles. Together, these components are far superior to anything on the market because each is designed to do a specific job, and do it extremely well. "Datacolor's Spyder3Studio SR is the most comprehensive color management system photographers and photo enthusiasts can have to ensure perfect calibration throughout the imaging process," says Christoph Gamper, Vice President, Consumer Business Unit, Datacolor. "It is an extremely attractive package, both in design and pricepoint, and was created by photographers for photographers to address their specific needs with specific solutions." Spyder3Print SR (Strip Reader) is a new spectrocolorimeter that incorporates significant advancements in ICC printer profile technology and a new software algorithm ensures fast, easy and accurate measurements for outstanding color and black-and-white prints. Users at all levels of expertise will now be able to easily and quickly create ICC profiles in minutes by using Datacolor's Strip-Reading Spectrocolorimeter and SpyderGuide. The Spyder3Print SR provides outstanding results with any combination of inks, paper, and printer. While users will immediately notice the benefits of the Spyder3Print SR in their color prints, custom ICC profiles for outstanding fine-art quality black-and-white prints is really where the product excels in performance. Like every other component of the Spyder3Studio SR, the Spyder3Print SR is designed to do one specific job, and do it well. Datacolor will exhibit its new Spyder3Studio SR for the first time at Photoshop West in Las Vegas (October 1-3) and at PhotoPlus Expo in New York (October 22-24). 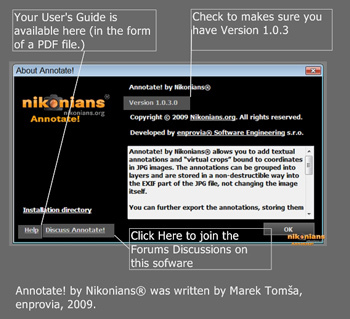 Your free software upgrade for Annotate! by Nikonians® is now available. Released less than two months ago, Annotate! by Nikonians® is a free software tool which enables you to easily make notes directly onto images without any image editing required. The new version adds features inspired by suggestions made through the discussion forum that has been set aside for this software. The suggestions of the community are helping to shape the functionality of the software. To check which version you have, just press your F1 key and you will be presented with the help screen as shown here. This image was quickly annotated to highlight features of the screen. New features in version 1.0.3 include: The ability to move annotation textboxes and adjust text size while exporting; adjusting location of the small software stamp (like a watermark) to not obstruct important parts of the image; and an updated user's guide. Download Annotate! by Nikonians® and join us in fine-tuning it with your own suggestions today. Adobe has provided interim support for the Nikon D300s and the Nikon 3000 in the form of release candidate plug-ins for Camera Raw 5.5 and DNG Converter 5.5. Download the RCs here. Editor's note: Release Candidate status means these plug-ins are interim and are not yet fully production supported. Weekend Shooting: From the jungles of Panama to martini bars in Orlando. For the MP3 version of this podcast (audio only) click here (15.1 MB). 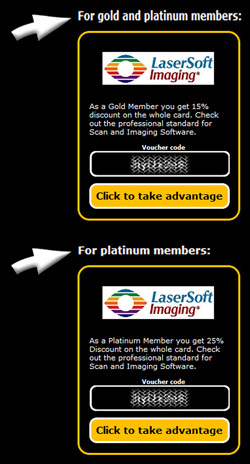 LaserSoft Imaging has just released new Nikonians Rewards vouchers for discounts of up to 25% on their products. Check your Nikonians Rewards page for the discount vouchers. Make sure you scroll down if you are a Gold or Platinum member. By scrolling down on the Nikonians Rewards page you will find the correct voucher numbers based on your membership (as seen here with the arrows). We have partnered with several vendors to provide our Silver, Gold and Platinum members with significant rebates on high quality products and services. Make sure you check in here regularly as not to miss out on the great deals available. The Nikon D3X has taken the top award as the 2009-2010 Professional Camera of the Year according to the prestigious European Imaging and Sound Association (EISA). Following the camera's previous win at TIPA for best D-SLR in the Professional Category, this latest honor reinforces the ground-breaking innovation and features of Nikon's flagship model. Congratulations to Nikon! His review of the Epson Stylus Photo R2880 includes his account of the process involved in printing some very impressive images, which our Nikonians community members are invited to download for personal evaluation. We mentioned a suprise ending? Take your time going through his lengthy review and as you follow along you will see he is seriously impressed with the performance of the R2880. The surpise will come when he weighs his personal shooting style and printing requirements in relation to the capabilities of this Epson printer. We don't want to spoil the surprise, so check it out for yourself. Nikon has announced the winners of the 2009 International Photo Contest. This year's theme, "At The Heart of the Image," drew over 51,000 entries from 153 countries and regions. See the stunning main category winners in Nikon's press release. Nikon has updated the View NX utility to support the newly announced D300s, D3000 and the latest Coolpix models including the camera/projector S1000PJ. For the MP3 version of this podcast (audio only) click here (19.8 MB). Have you ever looked at your prints and your monitor and wonder why the colors might sometimes not match? Or even viewing your online photos on two different computers, they seem to be off? Just walk into any technology store and look at the rows of monitors for sale - they all have different color renditions, hues and saturations. Many of our enthusiast and professional members know the answer - color management. In order to successfully manage your color - you need a colorimeter, such as DataColor's Spyder3. And for the month of August, DataColor is offering significant savings exclusive to Nikonians members on their Spyder3Elite system. Complete with software and target color patches, your monitor can be calibrated in minutes; and you can be confident that what you see on the screen is what everyone else will see - in print or online. In the latest issue of Nikon World, renknowned photo-journalist Ami Vitale explores the power and flexibility of the new Nikon D300S' video capabilities. When Nikon asked her to check out the new camera and see how video would fit with the way she works, she was enthusiastic. "I think multi-media is the direction we're all moving," Ami says. "It's another way to tell stories, and for me it's absolutely essential." See the compelling video, stunning still images and accompanying text on the Nikon World website. Topaz Labs, makers of popular Photoshop Plug-Ins such as Adjust, Vivacity and DeJPEG are offering a very generous 25% discount for all contributing Nikonians at the Silver, Gold and Platinum levels. Many of our members have discovered how easy and more powerful their image editing has become using these plug-ins. See the results for yourself by tuning into Topaz Labs online tutorials and keep up with the latest developments on their company blog. The Nikon COOLPIX camera lineup now includes four new models, with one featuring the world’s first built-in projector. 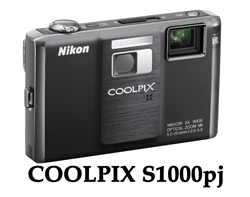 Nikon calls the COOLPIX S1000pj "Your Personal Theatre on the Go." With the touch of a button, users can project images and videos as large as 40 inches, and with the camera’s unique slideshow function, playback pictures with music, effects and creative transitions. Additional features of the S1000pj include: 12.1 megapixels; a 5x wide-angle Zoom-NIKKOR glass lens; ISO from 64-6400; a 2.7-inch wide-angle LCD display; 5-way VR Image Stabilization System; Subject Tracking; Scene Auto Selector Mode; Nikon’s Smart Portrait System and movie mode. 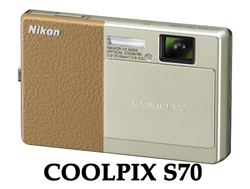 The COOLPIX S70 features 12.1 megapixels; a 5x wide-angle Zoom-NIKKOR lens; ISO 6400; 5-way VR Image Stabilization System; Subject Tracking; Scene Auto Selector Mode; Nikon’s Smart Portrait System and an ultra-stylish design. For consumers who never want to miss a moment, the all-new COOLPIX S640 is Nikon’s performance leader in the S-Series lineup. High performance features include ultra-fast auto-focus, the fastest start up time in its class** of a mere 0.7 seconds and short shutter release time lag. Additional features of the S640 include: a slim, stylish all metal body; 12.2 megapixels; a 5x Wide Angle NIKKOR lens; ISO from 100-6400 at full resolution; a 2.7-inch Clear Color LCD Display; 4-way VR Image Stabilization System; Subject Tracking; Scene Auto Selector Mode; Nikon’s Smart Portrait System and movie mode. 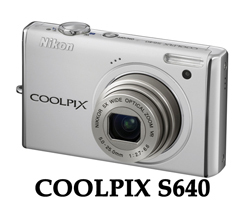 The COOLPIX S640 will be available in September 2009 for $249.95 MSRP and will be offered in various colors including: Calm Black, Velour Red, Precious Pink and Pearl White. Where style meets simplicity, the new COOLPIX S570 is ideal for entry-level consumers looking for a carefree shooting experience. The S570 features 12.0 megapixels; a 5x wide-angle Zoom-NIKKOR glass lens; ISO 3200 at full resolution; a bright 2.7-inch LCD Display; 4-way VR Image Stabilization System; Scene Auto Selector Mode; Nikon’s Smart Portrait System and movie mode. 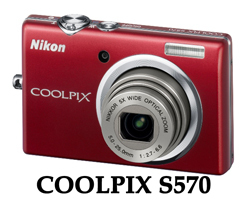 The COOLPIX S570 will be available in September 2009, for $199.95 MSRP and will be offered in various colors including Black, Red, Blue and Pink. The line of PhotoBert Cheatsheets that has been helping Nikonians carry quick guides to their favorite Nikons will now include the equivalent of a "Swiss Army Knife” of cheatsheets. The laminated and waterproof full color sheet folds to 8 ¾ inches by 11¼ inches. It unfolds to give you a five page no-nonsense guide to learning the basics of your digital camera, regardless of the make or model. "This CheatSheet was developed by a well-known digital camera “guru” with over 25 years of hands-on and teaching experience. This full-color, laminated CheatSheet describes over 20 key digital camera features in easy to understand language. 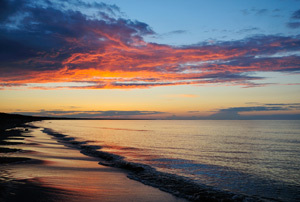 It’s applicable to ANY digital camera and will help get you up to speed on your camera’s features." 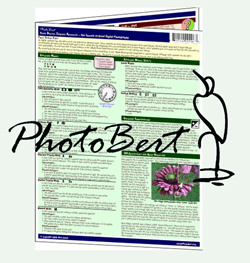 Nikonians on Silver level or higher get a 20% discount on all CheatSheets from PhotoBert CheatSheets. Make sure you check your Nikonians Rewards Page for the discount voucher.